In an ideal world, Massage would form an integral part of your self care routine to maintain wellness and prevent injury or pain. From increasing awareness to relaxation to pain relief, everyone can benefit from regular massages. Tension headaches and migraines: The muscles in your neck and scalp are often the root cause of these conditions. Did you know that a tight SCM (the cord like muscle at the front of your neck) can cause earache, headaches, watery eyes and sore throats? Plantar fasciitis: often the causal factor here is tight calf muscles and often this extends throughout your ‘posterior chain’ - the muscles down the back of your body. With a focussed lower leg and foot treatment backed up with hamstring, glutes and lower back, massage can relieve your symptoms over a course of appointments. Frozen Shoulder, hip and pelvic pain, lower back pain: ACMT (Advanced Clinical Massage Therapy) has a wide range of very focussed techniques that are incredibly effective in treating these conditions. Stress relief: the meditative quality of massage in the rhythm and low lighting allows you space to just be. On top of that, Massage will unwind all of that stress related tension we hold in muscles. If you’d like to take a step to a healthier, happier, pain free you, please book in to see me on a Monday, Thursday or Saturday at Weaver House. This week Reanne, our new Massage Therapist gives us some background on her previous career and training. Hello! I am Reanne Benson and I am an Advanced Clinical Massage Therapist. I specialise in chronic pain relief, especially post injury or surgery recovery. I have a strong interest in rehabilitation and biomechanics after recovering from a knee injury and subsequent surgery myself. During my treatments, I use a combination of traditional techniques alongside Amma (a Japanese therapy using deep static pressure), Soft Tissue Release (specific, focussed stretches for different areas of individual muscles), Acupressure, Trigger Point Therapy and Myofascial Release, which is especially effective in the treatment of scar tissue and generalised tension. I also incorporate Aromatherapy and Reflexology where appropriate for relaxation and to enhance treatments. 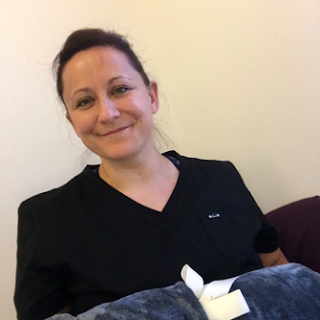 Qualified to BTEC L5 in Advanced Clinical Massage Therapy (ACMT) through Jing Advanced Massage Training in Brighton, I am also working towards a degree level qualification in Advanced Clinical Massage and Sports Massage through the same provider. Alongside ACMT, I am qualified in Equine Sports Massage and enjoy working with both horse and rider to improve performance. I am a member of both the SMA and ESMA. An outdoor person, I am a keen horse rider and competitor in Endurance Riding with my horse Harley. My dog, Elsa, helps with my fitness by getting me out for regular runs and I attend circuit sessions at my gym several times a week. Having recently left the RAF, I volunteer with the RAF Air Cadets, enjoy photography and to relax I love to curl up with a good book whenever I get chance.